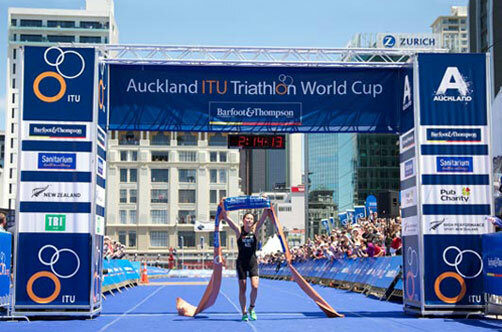 This weekend the Auckland ITU World Series is back in New Zealand. Along with the worlds best vying for supremacy in the Elite Women’s and Elite Men’s races, the Barfoot & Thompson World Triathlon event also features a range of mass participation races open to anyone to enter. Again, in 2015 The Ridler Mobile DJ is part of the Sports Presentation Team providing the music throughout the weekend as part of the event Expo on Saturday and for the various events and Elite Races on the Sunday. For the last 3 years, since the event came to Auckland, we’ve proud to be part of the team bringing the atmosphere to Queen’s Wharf in and around the Transition Area and spectator areas in front of The Cloud. This includes all of the official sound requirements including pre-race & transition music/effects and for the medal ceremonies at the conclusion of the Elite Events.